Apple’s shares have skyrocketed to almost $700 each today, after they announced pre-orders of the iPhone 5 have reached in excess of 2 million units!!! Comparing this to the iPhone 4 which obtained 600,000 pre-orders and the iPhone 4S of 1 million – this is HUGE! What is more, the company’s shares have risen over 70% this year… WOW! Furthermore, analysts have predicted that Apple could sell 10 million units by the end of the month and 50-60 million by the end of this year! 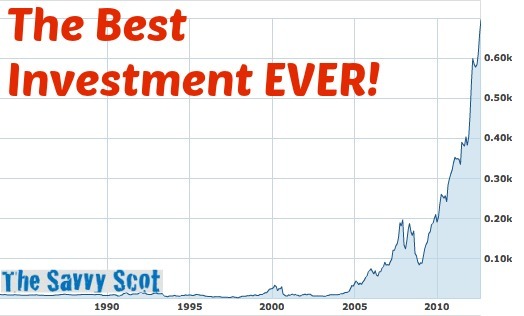 To put this in perspective, if you invested $1000 in Apple ten years ago, you would have $96,034.50 today – a gain of 9600%!! Not bad huh? The question is, where does it stop? If you had stock in apple back in 2007 / 2008 you might have thought that the drop that was to come would finish apple. Oh how disappointed you would have been if you sold your shares. You need an awful lot of money in the first place to invest in a company like apple when an ordinary share is priced so high. I know of a guy that put £10k into Apple 10 years ago… that was the best investment decision EVER! What do you guys think? Will Apple top $1000/share like analysts predict? Boy, I don’t know if they’ll hit $1000/share. They’re flirting with $700 today. I think in order for them to make it there that they’ll need a couple of new products that will really knock it out of the park. We’re talking about the rumored Apple TV and things like that. I think it’s going to be tougher with Jobs gone, but not impossible. It is a hard one to call! Apple simply need to do something with their ‘Apple TV’ range… it has sucked for way too long! savvyscot recently posted..What Does Professional Indemnity Insurance Cover? It hurts to see this, I want to cry, I wish i had bought apple stock even a year ago. I don’t know if it’s to late to buy, I definitely don’t want to buy high…. I think they can hit $1,000 but I think they are due for a big pull back sometime soon. I agree that it can’t go on forever.. the question is when will the hype die down?! I’ve thought for a long time that they can’t keep going up, but it seems the sky is the limit. Until someone provides some viable competetion, I think they could hit $1000. Someday, I’ll have to get an iPhone and see what all the fuss is about. You have a point Mike, BUT Apple have consistently (with one exception) performed over the last decade. Even if you invested 6 months.. a year.. 2 years ago you would be very well off today! Not many other companies are like Apple in that sense. Apple is obviously a baller company, they’re doing well, probably going to keep doing well. But all that is already priced into their stock price. Honestly, from a pure hardware/technical stance I think their latest phone sucked, haha. Investing in Apple is really wise if you can analyze what will be the trend in years time. With the trend going on, it will reach $1,000/share.Thanks for sharing the article. I am guessing that Apple will hit top $1000/share milestone till end of the 2013 but there may be a minor downfall within this period. As Google, Facebook and Microsoft are back of Apple and will introduce amazing things in 2013, specially Microsoft. It is not easy in stock market to predict about next 10 years. However this history may be repeated with Facebook as well within 2015-2020.